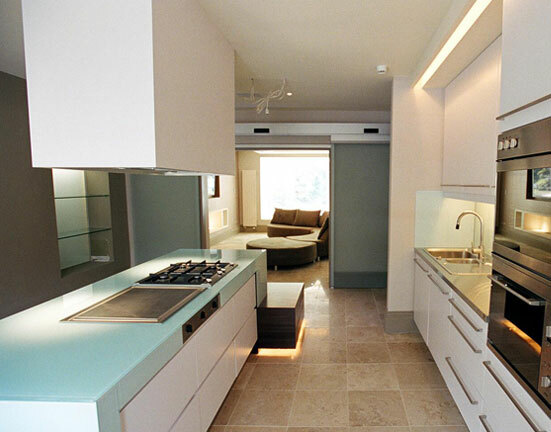 The kitchen consisted of a main island unit with twin hobs on a glass worktop, with a cooker hood above. We built a Wenge wood bench, which wrapped around one end, and added a stainless steel table at the other end. The wall units and base units were spray-lacquered and finished with bespoke stainless steel handles. The shelves were made of glass with sandblasted panels, and a fireplace was built into the wall. The kitchen also had a tiled limestone floor with under-floor heating.